Downtown Delight – Landscape Plus Ltd. When we got asked to rework this downtown beauty we were truly thrilled. In the front, a large single dramatic urn accents the stone steps, landing, and custom ironwork leading to the lovely front door. Pedestrians may walk a flagstone path through flowering shrubs and perennials to the street side or access the vibrant red reclaimed street pavers surfacing the driveway. 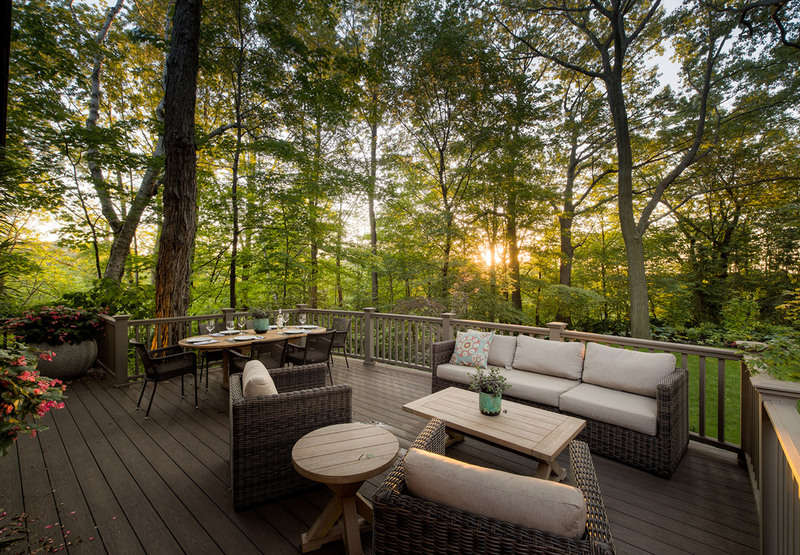 The backyard is blessed with an amazing tree canopy and stunning ravine views. The main floor of the house flows out onto a large deck area that allows for easy and quick access to outdoor barbecuing, dining and casual deep seating. The rear doorways are framed with a copper overshot roof that reflects the one over the entranceway at the front of the home. A stairway down from the deck area leads to a large sitting area adjacent a newly built Rumford Fireplace. Settings like this light beautifully and this yard is no exception. Large deep garden beds surround the space and create a dramatic setting for moments of peaceful solitude or amazing entertaining!